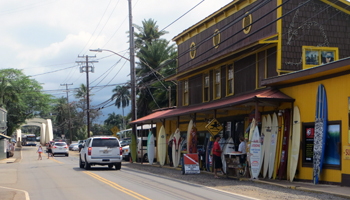 Historic Haleiwa Hawaii: The Town that Surfing Built. 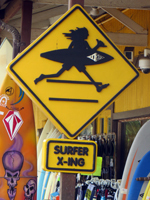 Haleiwa Hawaii: The Town that Surfing Built! The quaint little town of Haleiwa Hawaii lies smack in the middle of world-famous North Shore Oahu. So basically, Haleiwa (pronounced: hah-ley-ee-vah) is a surf town. Many restaurants, surf shops, art galleries, and souvenir shops all have beach related themes and cater to a steady stream of beach-goers. With numerous restaurants and a few bars, Haleiwa is a great place to find refreshment after an exhausting day at one of the incredible North Shore Beaches. Then after you eat, stroll around and do some window shopping. Honestly, it’s rare when I can drive clean through Haleiwa Hawaii without stopping for some kind of treat. There are two main reasons for this: shave ice and huli huli chicken. If you ever drive through a roasted chicken scented cloud of smoke, you too will find yourself tempted to stop. When that happens, just look to the side of the road for the guys out tending 20’ long grills, and that’s huli huli (translation: turn turn) chicken. Go get yourself a half-chicken and enjoy! 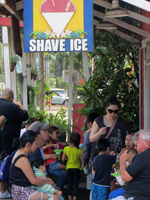 As for the shave ice… I think Haleiwa is every bit as famous for this cool treat as for the big surf! Just look for the long lines of people stretching right out of the stores. I realize the treats aren’t free, but the window shopping is. And depending on the time of year, you might even bump into professional surfers around town. Such encounters are most likely to occur during the Vans Triple Crown of Surfing, which generally runs from mid-November to late December or during the Eddie Aikau Big Wave Invitational in January/February; but I’ve been out in the water at Pipeline with Hans Hedemann in the middle of summer. So you never know. (Hedemann was quite a bit better than me, if you’re wondering). If you really hope to see surfers, Café Haleiwa might the place. Several years ago, the walls of this little breakfast and lunch restaurant were literally covered with autographed photos of surfers who had eaten there. Now, they have consignment art on the walls. I miss the surf pics. But the food is still good; so I suspect the surfers keep coming. 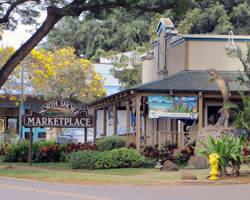 Although most of Haleiwa Town really isn’t that old, it’s made to look old in keeping with the area’s rustic aesthetic. 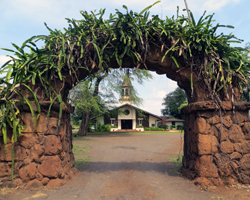 As a result, Haleiwa is one of the few places on Oahu that still feels like it’s out in the countryside. When you hear references to “town and country”, town is Honolulu, and country is Haleiwa. For this reason, a day in Haleiwa Hawaii is a popular getaway for many local residents, as well as Waikiki-weary visitors. The down-side of all that popularity, however, is that traffic through town can get very heavy – especially on the weekends. They’ve actually built a bypass road to help ease some of the motor vehicle congestion in Haleiwa Town; but the total number of cars is still as much as the little two-lane road can handle. The situation gets further complicated by all the pedestrians trying to walk along and/or run back and forth across the street. There are no sidewalks and only a few crosswalks, so traffic is almost always moving at a crawl through town. Finally, some Hawaii history of dubious significance: for anybody who could bear to sit though an episode of Baywatch Hawaii (and assuming you still care), the show was filmed at Alii Beach Park (right next to the marina) in Haleiwa Hawaii. It’s my understanding that this was the major set for all episodes; but I can’t personally verify that because I never made it through more than 30 seconds of one episode. Anyway… when I’m on vacation, I like finding and cruising around quaint little towns. I like to experience authentic Americana, if only for a day. So if you’re like me in this regard, Haleiwa Hawaii is probably that town for your Hawaii vacation. Enjoy. Need a ride out there? If you don’t have a rental car and/or don’t feel like driving, consider booking a tour. 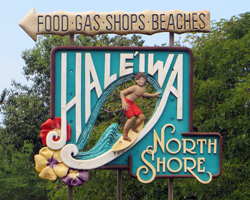 North Shore / Haleiwa Town - CLICK HERE! (Link opens a new window/tab).